In Great Golf for Life: The Teaching Professionals’ Guide, award-winning PGA professionals Jim Linkin and Patrick Livingston, founders of National Golf Schools, the “Number One Resort Golf School in the World,” share with you a wealth of knowledge that has helped thousands of their students play the best golf of their lives. In this book, they address the changes golfers go through as they age and the adjustments in their swing that are necessary to play their best. Their simple approach to the golf swing will provide you with a logical way to improve, no matter what level of golfer you are. 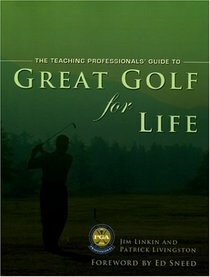 Great Golf for Life: The Teaching Professionals’ Guide takes you all the way through the golf game with stories and swing keys that are fun and easy to remember. The book is broken into subchapters that can be referenced quickly. “Being Open to Change,” the first chapter, prepares you mentally to be ready to learn. From there, the chapters focus on getting your body ready to play and how the right equipment can help you perform better. Chapter four begins actual instruction and gives basic fundamentals. The following chapters address “The Full Swing Using Different Clubs,” “Short Game Sharpness,” which is a scoring must, “Getting Good from Bunkers,” and “The Fine Art of Putting.” In chapter nine, “Let’s Practice, Let’s Play,” you will find out how to correct the age-old problem of hitting it well on the driving range, then playing poorly on the golf course. For women, chapter ten is “Additional Facts for Ladies Only.” Chapter 11 wraps it all up with great tips on how to learn or take a lesson, swing aids, playing lessons, drills, and more.Great Golf for Life: The Teaching Professionals’ Guide is a must-read for all golfers. Find out why so many students trust their swings to these top professionals. Enjoy! PGA professional Jim Linkin is director of instruction for National Golf Schools. He was chosen by his peers for the coveted 2001 PGA Teacher of the Year award in his chapter of the North Florida Section. He is a radio talk show host and has also written articles for major publications including Senior Golfer Magazine. Jim is a renowned expert on senior golfers and how they can get the most out of their games. He is the author of the highly rated book The Link to Senior Golf: How to Play Better and Have More Fun and has coauthored another teaching manual for PGA professionals with Pat. Jim is also an experienced instructor for physically and visually challenged golfers, and received the 1999 Saint Petersburg YMCA Community Service Award for work with underprivileged children in the Tampa Bay area. He is one of the top instructors in the country. PGA professional Patrick Livingston is CEO of National Golf Schools with 30 locations nationwide. He is on the board of directors for his PGA chapter, the recipient of the prestigious 1999 PGA Standard of Excellence award and the 2002 and 2003 PGA Teacher of the Year award in his chapter of the North Florida Section. He is listed in the Consumers Research Council 2002 Guide to America’s Top Instructors. Among his many other accomplishments are appearances on ESPN, radio talk shows, and published articles in many golfing publications. He is coauthor of a teaching manual for PGA professionals with Jim. He has been an experienced instructor for years and is one of the top instructors in the country. Pat and Jim co-host The PGA Pro’s Hotline radio show, a popular Monday evening show in Florida. He too is an experienced instructor for visually/physically challenged golfers and has been the keynote speaker at several of their state and national awards banquets.